Equi-Heart Pledge: Day 12: Equine Alchemy- Transforming Darkness to Light with Horse! Day 12: Equine Alchemy- Transforming Darkness to Light with Horse! Did you know that the heart is a transformer of energy? Available at any moment to transmute heavy, dark energies to Light. And Horse hearts are especially amazing transformers! They have always offered their hearts to humanity to help us shift out of the darkness! Only, we haven't always been aware that horses were offering this great gift! 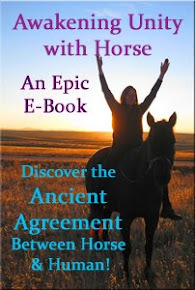 In honor of this weekend's special Wisdom Horse Playshop - Equine Alchemy- I decided to share with you an energy transforming exercise out of my e-book, Awakening Unity with Horse: Revealing the Ancient Agreement between Horse & Human. You can use this exercise any time, any where, with or without the physical presence of Horse- and Horse will join with your heart to shift any darkness you are ready to release and dissolve. How cool is that! You can even call on Serendipity here, in the video, to help you if you don't already have a special horse friend. From whatever distance, you can connect with her, through your heart-felt intention, and she'll work with you! So give her a call sometime! She'd be delighted to connect with you. Want to grab this exercise in a Mp3 Guided Meditation format? 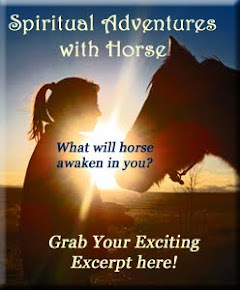 It comes along with 4 other life-transforming audio exercises, which accompany my new e-book, Awakening Unity with Horse: Revealing the Ancient Agreement between Horse & Human. What are you ready to use Equine Alchemy to transform? Please comment and share!